For the girl that loves bringing style to her home enable that creative passion by gift her with the Be your own Decorator book, not only will it provide much needed encouragement it also makes a fantastic coffee table book which will most likely start many a great conversation. Book by Susanna Salk check out a preview at 1stDibs and order at Amazon for $32 (list price $45 - image via 1stDibs). For the girl that believes leopard is a neutral and loves to channel a model off duty look (I am thinking Joan Smalls and Rosie Huntington-Whiteley) you need not look further than Diane von Furstenberg's Marvella Leopard Wool Metallic and Leather sleeve jacket $275.40 (originally $765 - image via Saks Fifth Avenue). 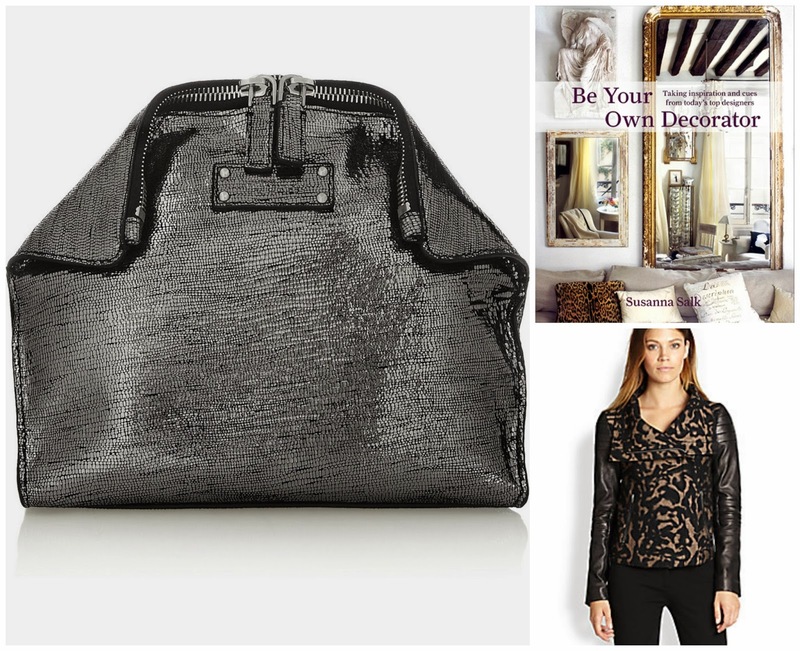 For the traveling girl that could use a cool bag to stash her makeup essentials & that could, perhaps, double as a night-time clutch: Alexander McQueen's De Manta textured leather cosmetic case in a cool Silver $232.50 made by the house behind Kate Middleton's wedding dress(originally $465 - image via Net-a-Porter). For the conservative girl you want to give a dash of cool glam factor a jeweled necklace sweatshirt in soft neutral colors from J.Crew: Necklace Sweatshirt in Heather Charcoal $79.99 + additional 30% off with code GIFTNOW (originally $98 - image via J.Crew). For the gadget lover that cannot imagine going anywhere without her iPad mini: Marc by Marc Jacobs Reluctant Stars mini tablet case in Purple for $29 (originally $58 - image via Net-a-Porter).